We will no longer be communicating through emails sent from the section President. On Tuesday, April 17th we will delete the list serv and all SWE emails will be sent from our OrgSync account. If you want to be on our roster, stay up to date on SWE programming, and be a member of our section then you must join our OrgSync page. It's quick and easy to sign up! Make sure to are forwarding OrgSync messages to your email by checking your settings so you don't miss out on anything SWE! 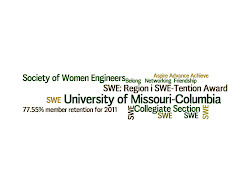 If you are a graduating senior, still join SWE on OrgSync! We will be using this site to keep in touch with our Alumni! If you have any questions regarding OrgSync please contact Audrey Freiberger (acf8b4@mail.missouri.edu) and she would be happy to help you!